I once had a large affinity for the "clean" Saison. The first time I drank one I realized this would be my favorite style of beer. I loved everything about it . The crispness of it, the sharpness from the hops and yeast, the earthy grain and peppery spice followed by a subtle tartness all had a hand in forming this to be my favorite style of beer. Then it happened... My first foray with wild yeast and sometimes bacteria. I was smitten. Everything I loved about a clean Saison was taken over with funky, more tart, sometimes sour beers. I almost forgot about my original best friend that I loved to drink and brew. 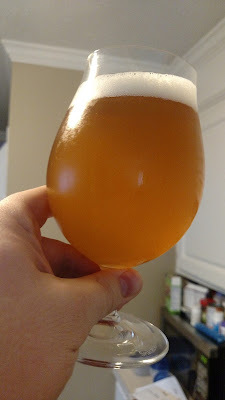 A little while back I decided to brew a clean Saison for the first time in a long time. While I still love the "wild" versions of a Saison best, the pure Saison yeast beer is still a magnificent thing when done right. It's busy and simple at the same time. 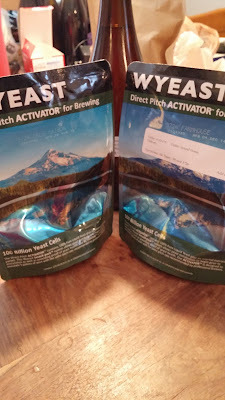 There is something to say about a yeast that you can use with a 100% pilsner malt and maybe just one type of hop to create an excellent beer. It's just different than anything else to me. I've brewed pale ales, IPAs, stouts and even once did a brown ale (my least favorite beer style). None of them I've done have created the affinity that Saison has. At the time of this writing, for the last two years I have only brewed about four different times that weren't Saison. A few "Lambic" style beers that I intend for blending. Then there was the recent Old Ale with Brettanomyces and a cousin of the Saison, a Biere de Garde. Other than that, I've pretty much brewed Saison exclusively for going on two years. Even my buddy has been surprised when I tell him I'm brewing something different. It's just my passion. All that said, I decided in February of this year that I would brew a clean Saison. No Brettanomyces, no wild Sacc and no LAB at all. This would prove to be challenging and humbling for me. I'm pretty positive my entire kitchen is covered in Brett and LAB. As much as it is handled and used I'm sure it has to be embedded in there. It may not ever affect anything as I haven't had any unwanted infections yet, but I am going to do my best with this one to keep it that way. I wanted to use a classic Saison yeast and one that has been used as my "house" yeast for a while now. Most every Saison I've brewed has involved Wyeast 3726 Farmhouse Ale yeast. From the first time I used it I knew it would be my workhorse. Above all the others I've tried this has been my favorite. I really like Wyeast 3711 when using a lot of American or New Zealand hops, but when I'm going for a traditional flavor profile I like 3726. Luckily, in 2014, Wyeast released it again so I could get a clean strain to brew with. I decided I would blend that yeast with a classic Saison yeast that has been used in many brews along the way. Wyeast 3724 seemed like the perfect companion. Bringing in its signature dry fermentation with hints of pepper, bubblegum and a hint of tartness, I knew it would work very well with 3726's peppery, tart and phenolic flavors. All that was left was to build a grain bill. Below is what I finally settled on for this beer. I had been wanting to try Vienna and Munich malts in my Saisons. For this one I decided to go with Vienna. I used Munich in another clean brew with The Yeast Bay's Wallonian Farmhouse Yeast. I may write about it as I've been drinking on those beers for a little while now. Hops on hops on hops. 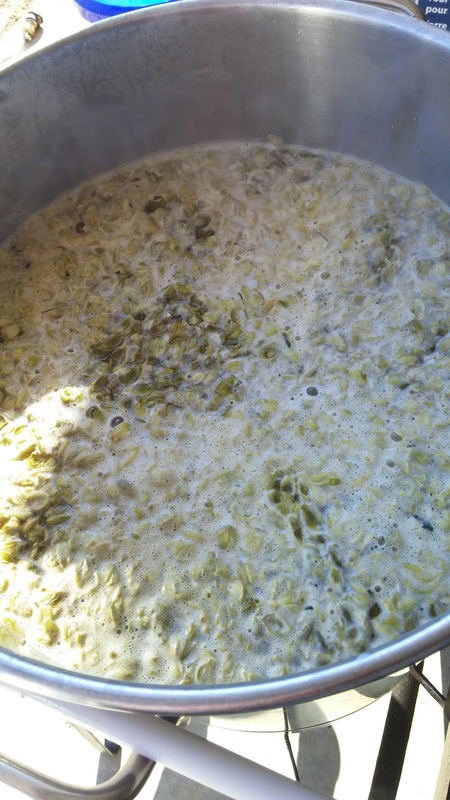 Whole leaf hops! I decided not to make a starter since I would be using less than two month old smack packs. All of brew day went pretty well, except the leaf hops clogged my dip tube on my kettle. I'll probably stick to pellet hops from now on. The original gravity, at the end of the boil, was 1.058. This was perfectly acceptable for what I was shooting for. I cooled the wort after a 90 minute boil to 75F, and pitched the two smack packs of yeast. I put the Better Bottle into my fermenter and set the temp to 68F. Within twelve hours, we had kraussen beginning to form. I bumped the temperature up 1 degree F for the next six days. From there I let it free rise to where the yeast was happy. After seven days the gravity had reached 1.008. Knowing my past experiences with 3726 and 3724, I decided to give it a few more weeks. It spent about two months total hanging out at room temperature. 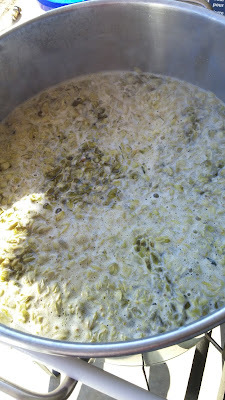 After checking the gravity (1.004 then) I tossed one ounce of Saaz pellet hops at 3.5AA in for dry hopping. I let those sit for six days before I took it to be bottled. I bottled this batch with 4.5oz of dextrose. It's a little higher in ABV than I like to shoot for with my Saisons. 7ish % ABV is not that far out of style, and I'm definitely happy to get the beer to dry out as much as it did. I like to give my beers at least a month in a bottle, sometimes longer. I think it could still use a little more time. I'm used to bretta and wild sacc being in there, and usually they are carbonated well in a month's time. After two months in the bottle, this is closer to where I want it, but still not what I'd like it to be. Appearance: My beers always tend to be just under or right at BJCP guidelines for Saison. I'm not worried about it because I'm not one to usually brew to style. If I had to guess though, this would be somewhere around 4-4.5 SRM like Beersmith said. Pretty clear with a very nice white head that sticks around to half a finger while drinking the beer. The chill haze faded away but it never really got just super clear. I don't know if that was the leaf hops or what. I honestly don't mind, I like a cloudy beer most of the time. It looks darker due to poor lighting. Aroma: The first thing that hits me is an herbal earthiness with hints of some pepper spice. Little bit of tartness and some grain action. Maybe a small hint of citrus but not a ton. All together, a classic clean Saison nose. Taste: Honestly it's very nice but not as exciting as brewing with bretta in a Saison. It's classic dry hay, black peppercorn and a subtle tartness. Super dry mouthfeel and not quite enough carbonation. I'll let the rest of the bottles sit a while to hopefully get a little more. I doubt it will pick up a ton. Overall: I think this is one of my better beers to introduce some friends to homebrew. It's clean, crisp and still has a ton of flavors to show them the difference between this and standard beers. I'd definitely brew this again but I think I'll add some bretta in to the mix. I've been thinking about trying a little Belgian Wit yeast in with the Belgian Saison strain to help with some flavors and the stalling. I personally haven't had the stall but one time and that was a perfect time to add the Brett in there. I'll work this recipe up again and try the Wit/Saison combo. It's rumored they are from the same parent yeast (red wine) anyway. Great blog. I'm actually getting past my clean phase with the current batch I brewed. Split 10 gallons, 5 clean and 5 conditioning with Brett so excited to taste the results. I was wondering if you found the acidulated malt to contribute any tartness or noticable acidity to the finish/flavor of the beer? I've been toying with the idea but haven't found clear consensus that it actually contributes flavor to the final product. Thanks! Personally, I think it contributes very little at this percentage to tartness in the beer. I used it for quite a while at this percentage to lower my mash pH. I was using spring water from Kroger at the time and my mash would be just a bit high in pH, around 5.7-5.8. Rule of thumb with acid malt that I was going by was each 1% of the grain bill would lower the pH by .1. I was using pH strips instead of a meter at this time and that was getting me close. I've never upped the percentage to try and get more acidity from the malt. I believe Mike Tonsmeire did this experiment on his blog and didn't have any noticeable results. I love split batch brewing! I'll be posting a couple of those in the future! Thanks for reading! Cheers!